Superflow Boston 2017 - Go Long! Shifting the Dialogue on Super Bowl Sunday with a SUPERFLOW Yoga Class in Boston! Featuring a dynamic line-up of yoga talent from both coasts in a spectacular downtown setting, SUPERFLOW is the opportunity to commune with kindred spirits and power up naturally in preparation for one of the country’s most celebrated sporting events. 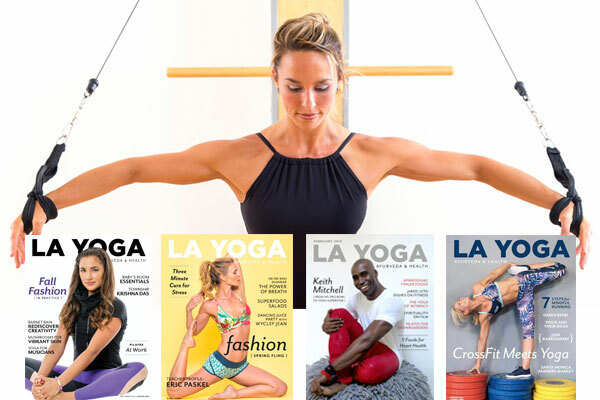 Three hours of cutting edge yoga, the latest in yoga apparel and accessories, high-powered products and a swag bag worth more than the ticket price! This year will include an information packed panel discussion with industry experts moderated by Marylee Fairbanks prior to the class. This is an afternoon not to be missed. 2017 Teacher lineup: Sienna Creasy, Anthony Tomasi, David Vendetti, Felicia Tomasko. Complete bios below. Our focus and theme this year is Go Long. When we Go Long we cultivate resilience, build strength, and think about how our daily practice has a bigger impact on our lives. These four amazing high profile yoga teachers have created an all-levels class that promises to deliver a full-body experience focused on resilience, strength, relaxation and meditative awareness. Prepare yourself to watch the game by coming together with your friends and fellow yogis for a fun and active practice ending with restorative yoga and gong meditation. Bring a friend and join us for our Second Annual SUPERFLOW right here in Boston. Explore or book rooms or spa treatments at the Intercontinental Boston. TICKETS ARE $75 WITH EARLY BIRD PRICING OF $60 AND SPECIAL BRING A FRIEND TWO FOR $100 UNTIL JANUARY 21st! Sienna Creasy is a Zen Rebel who blends peace and transformation within her teachings. The experience of the calm before the storm can be embodied in a liberating opportunity...an Inner Revolution on the mat. Sienna served in the Peace Corps in both Bangladesh and Jamaica, finding her soul connection in Jamaica where she currently resides. With a foundation in Prana Flow with Shiva Rea for over 11 years, Sienna creates an experience of movement that integrates the energy of the island with fierce embodiment. Yoga is a method of release AND a space of creation, there is an opportunity for each of us to have a very unique experience as well as a shared communal ritual. Sienna has been published in LA Yoga, Elephant Journal and Boston Yoga as her words weave a place of healing for those dealing with grief, addiction recovery or just plain '"stuckness". Felicia Marie Tomasko RN, E-RYT 500, inspires people to follow the path to personal freedom and vibrant health through the practice of Yoga and Ayurveda. She teaches a heartfelt exploration of shakti, sacred energy, through asana, pranayama, concentration and relaxation and maintains a private practice in the healing tradition of Ayurveda, a system of holistic and integrative medicine native to India. Ayurveda shares the same philosophy and ways of approaching the body, mind and spirit as Yoga and emphasizes our relationship to our body, breath, spirit and to nature within and around us. The dual systems of Yoga and Ayurveda, while seemingly ancient and esoteric, hold vital lessons for us to learn how to live with intent and address the needs of living in the modern world. Felicia believes in humorously making these concepts relevant to modern, everyday life. Felicia integrates more than twenty years of study of the ancient approaches of Yoga and Ayurveda with her training and licensure as a registered nurse. She is the Editor in Chief of LA YOGA Ayurveda and Health magazine and serves on the board of directors of the California Association of Ayurvedic Medicine and the National Ayurvedic Medical Association, on the advisory board of the Holistic Option and the Leadership Council of the Green Yoga Association. She is a featured voice on Intent.com and writes regularly on health and well-being for a number of books, newspapers, magazines and websites. In addition to Yoga and Ayurveda, Felicia has worked in cognitive neuropsychology and plant biochemistry research and has degrees in nursing and environmental biology. Anthony Tomasi (EYRT200), a popular north shore vinyasa flow instructor, teaches over 15 classes in and around the Boston area in any given week. If you haven't crossed paths with him in a local studio, then chances are you have seen his smiling face in store at lululemon at Lynnfield's Market Street where he serves as an Ambassador. A Boston native and former hockey player, Anthony (or "Ace" as he is known to friends) trained at The Yoga Loft under Jen Ryan. As of late, his passions have broadened to include acroyoga. These adventures find him leading a variety of workshops and specialty classes throughout New England with his yoga partner April Lyn Graffeo. “Yoga allows me to be who I am without struggle. To notice, breathe, remember and enjoy this body, this moment. I love returning to my yoga mat to play in the body awakening, breathe into a heart wide open and find gratitude for the infinite that I forgot was me.” David is the owner of South Boston Yoga and was voted Best of Boston by Boston Magazine in 2005 and 2011. His classes integrate a clear foundation in anatomy with intelligent alignment, hands on adjustments and ever evolving flows to heal the body. David encourages his students to cultivate a deep passion for self examination and light hearted exploration. Intercontinental Boston 510 Atlantic Ave.
© 2019 BrightStar Live Events on behalf of Bliss Network, LLC. All sales are final. Tickets are non-refundable.